What a joy has been mine to have had the privilege of being used of God as Founder-President of Conservative Theological University. Over the past years we have seen multitudes of men and women refine and develop their gifts for serving God in the ministry of Evangelism, Missions, the Pastorate, Christian Education, Christian Counseling and many other focus areas. Conservative Theological University provides Academic-Biblical training leading to a degree equipping for ministry service for our Lord Jesus Christ. Because we live in a culture that is filled with false claims, I can understand your honest analysis of an academic educational institution. I therefore urge you to make any desired test concerning the merits of C.T.U. Our degree programs are exclusively for ministry. The mission of Conservative Theological University is to make the truth of God's Word accessible "worldwide," through instruction that is academically sound, education that is fundamentally Biblical, and training that is realistically practical. 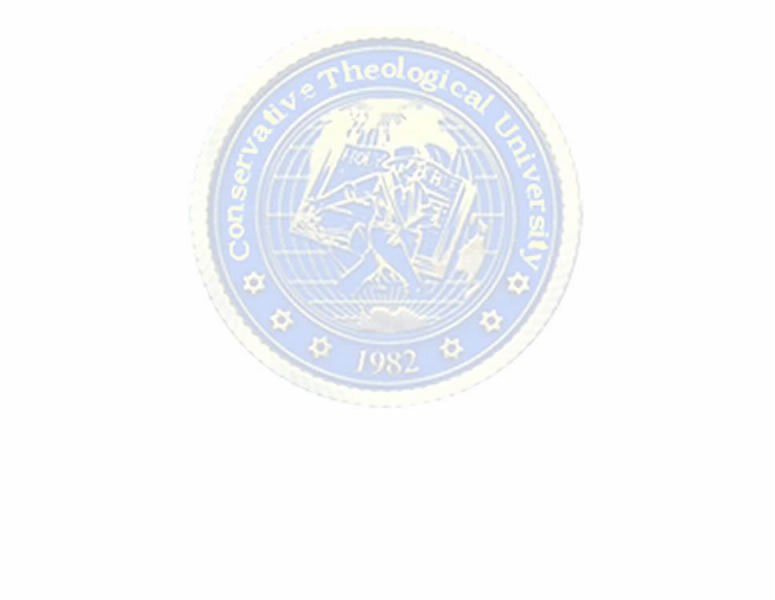 This vision includes both the areas of thorough Bible knowledge, as well as ministry skills development, through on-campus and off-campus (external) degree programs.Conservative Theological University was established by the grace of God in 1982, chartered by the State of Florida and governed by a Board of Regents. Conservative Theological University is a certified member of the Council of Private Colleges of America, which certifies C.T.U. as a recognized academic institution. CTU is also active members of the Council of Private College of Florida. Our degree programs are certified by the Council of Private Colleges of America and approved by the Florida Council of Private Colleges.The University has been blessed with capable, experienced, respected and qualified faculty, staff and administrative leadership. Our Christian professors are theologically conservative, Biblically sound, academically qualified, spiritually sensitive and personally concerned for each student.Conservative Theological University offers courses of study leading to earned degrees in both undergraduate and graduate levels, from the Associate through the Ph.D. Degrees. Conservative Theological University is dispensational in its Biblical hermeneutics and interpretation of Scripture. We also believe that sign gifts of the early Church have ceased and are not operative today. Our University admits highly motivated, qualified men and women who are involved in Christian ministry or who are preparing for the area of service the Lord has called them. I am honored to be the President of this University, and I am excited about the opportunities God has given us to minister through higher education.We have thousands from across America and around the globe that are serving our Lord as proud C.T.U. graduates and active students! I invite you to call or write us for more information.